Summer has finally arrived, so I’ve decided to feature a couple of widely available wines that should pair perfectly with the warmer weather. First, we look towards grilling wines, and for the 4th of July or that hot summer day after the holiday, there is nothing more American than Zinfandel, which is arguably the only varietal unique to this country (there are genetic equivalents abroad that go by other names, but I digress). California has seen three straight strong vintages of this grape, and the 2009s may be the best of all. And for some cold day time sipping wine, we look towards a huge value Riesling out of Washington state. Cheers! Seghesio Zinfandel Sonoma County 2009, 90 Points, $24, 69,000 cases produced- Juicy aromas of wild berry, vanilla bean and cinnamon spice. Suave and focused with its boysenberry, dark raspberry and blueberry fruit notes that lead into steady undertones of vanilla, mocha bean and exotic spices. Long, spicy finish with delicious fruit notes lingering. Columbia Crest Riesling Two Vines Columbia Crest 2009, 87 Points, $8, 65,000 cases produced- Lively aromas of grapefruit that boast a tropical hint. Polished and creamy on the palate with its luscious melon, pear and grapefruit citrus that leads into undertones of wet stone mineral and finishing with a honey note. A sweet wine but balanced well with a sturdy burst of tart acidity. Is Obama Surprised That The U.S. Employment Situation Is Still An Unmitigated Disaster? Yesterday’s disastrous unemployment data should come as no surprise to anyone who has been paying attention to the economic developments over the past month. Following an inflation-themed asset rush in the early parts of the year, the market has reversed course and began to face the reality of the national economic debacle that continues and worsens by the day. The Dow finished down on the week for the fifth consecutive time, the longest such streak since 2008, while the unemployment rate continued to hover around unacceptable levels, actually upticking to 9.1% over the past month. It should be clear by now that the optimistic pundits describing the so-called “recovery” may have been tuting their horn a bit early; as we near the two year anniversary of a near financial meltdown, things are not getting better. They are getting worse, and our leaders appear clueless as to how to solve the problem. I don’t pretend to have all of the answers, but will offer a few quick points that Mr. President either refuses to acknowledge or has yet to discover. What frustrates me the most is that in speeches like what I have posted above, he seems to understand the problem perfectly, but is infinitely misguided in determining the proper solutions. On a broad scale, the fiscal issues facing the United States are twofold: Government debt is expanding at an unsustainable pace that threatens the credibility and survival of the dollar itself, while at the same time the nation’s labor force is struggling to find work, which is almost single-handedly destroying the real estate market. I wish there was a way to solve both of these problems at once, but unfortunately, there is not. Obama’s solution to the catastrophic debt situation involves some moderate spending cuts combined with tax hikes upon the nation’s wealthiest members. As he stated in the above speech, “I say that at a time when the tax burden on the wealthy is at its lowest level in half a century, the most fortunate among us can afford to pay a little more.” (around the 34:40 mark). The President is correct on one count: the most fortunate among us can certainly afford to pay more. 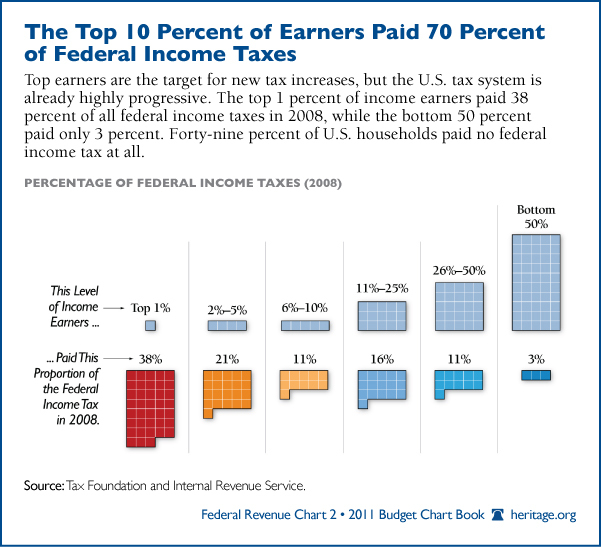 Whether or not they should be obligated to so that the government can continue to spend recklessly is another topic altogether, especially considering that the top 5 % of the nation’s earners already shoulder 60% of the tax burden…a number that has been increasing over the last three decades. Let’s deal with the issue of unemployment first. To quote Bill O’Reilly, who summed it up perfectly on his Talking Points Memo Thursday night, “Mr. Obama wants to raise taxes on the affluent, including small business owners who hire people. Does that make sense to you? If you want more jobs, you must give business incentives to hire, not take more money away from the entrepreneurial class.” Mark my words- Until we see across the board tax cuts, we will not see increased employment opportunities either. Even keeping taxes at their current levels will not alleviate the problem, and raising them further will continue to strain employment opportunities in America. No amount of government spending can encourage hiring in the private sector. Of course, lowering taxes across the board also lowers revenue, so while this solution helps to solve one problem, it exacerbates another. 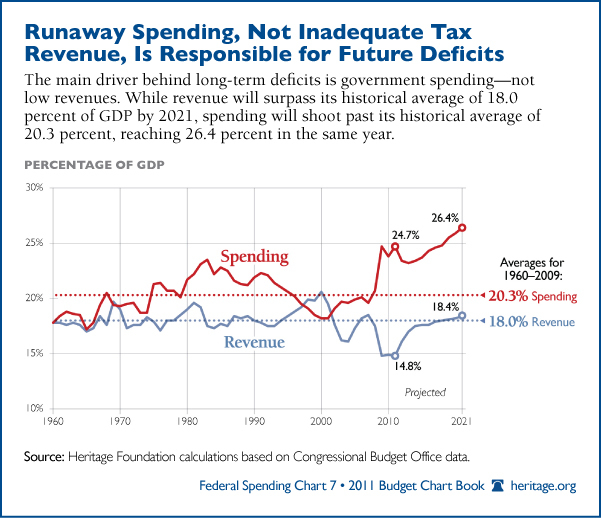 However, it is important to note that Washington does not have and has never had a revenue problem. It has a spending problem. How can a government that refuses to live within its means expect its citizens to behave in a fiscally responsible manner? Abolishing that 1% of foreign aid that the President scoffs at around the 14:00 minute mark of the above speech (much of it to countries who hate Americans) would be a good starting point for trimming down the spending, not the laughable $38 million package agreed upon in Congress. His ideas to cut areas of defense spending and to restructure Social Security, Medicare and Medicaid are steps in the right direction, but are ultimately not enough to solve the problem. Taking steps away from what is becoming a culture hell-bent on entitlement would have an immediate impact as well. An aggressive tax-hiking stance, especially while targeting the section of the country that has been funding this record government spending spree and doing most of the hiring, will only serve to cost Americans more and more jobs. The only solution is to cut taxes and limit government spending massively. Until you can accomplish that Mr. President, don’t be surprised that this once strong nation is slowly but surely decaying on your watch.